Hispanic voters are nearly three times more prevalent in states that gained congressional seats and Electoral College votes in the 2010 reapportionment than they are in states that lost seats, according to an analysis of Census data by the Pew Hispanic Center, a project of the Pew Research Center. 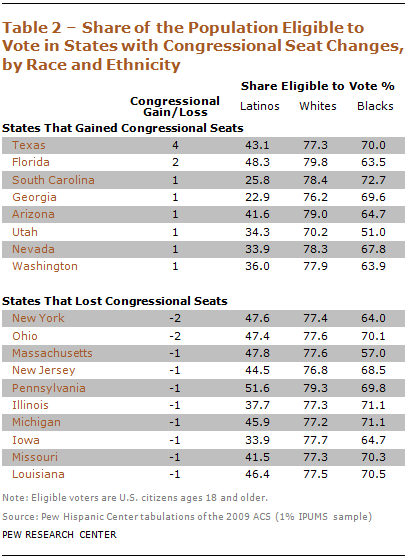 Based on averages reflecting congressional gains and losses, 15.2% of the eligible voter population in states that gained seats is Hispanic, compared with just 5.4% of eligible voters in those states that lost seats. With these reapportionment changes, Latinos likely will play a larger role in national politics in the coming decade. Two states that gained seats, Florida and Nevada, have been key battlegrounds in recent presidential elections (having voted for the Republican nominee in 2004 and the Democratic candidate in 2008). In both states, Latinos are a growing share of eligible voters. Even so, the number of the Latinos eligible to vote continues to grow. Since 2000, nearly six million more Latinos have become eligible to vote. The bulk of this growth was attributable to the five million U.S.-born Latino youths nationwide who turned age 18 during this past decade. That translates into an additional half-million U.S.-born Latinos coming of age each year — a pattern that is certain to persist, and grow, in the coming decades. No matter what happens with immigration patterns in the future, the aging of the U.S.-born Latino youth bulge ensures that the electoral strength of the nation’s largest minority group will continue to grow in the coming decades. And much of that growth will take place in states that have gained congressional seats and Electoral College votes. 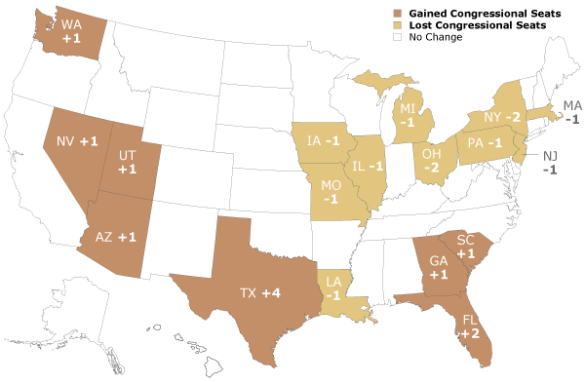 Based on results of the 2010 Census, eight states — Arizona, Florida, Georgia, Nevada, South Carolina, Texas, Utah and Washington — will gain congressional seats and Electoral College votes. Texas will gain four, Florida two, and all others one. 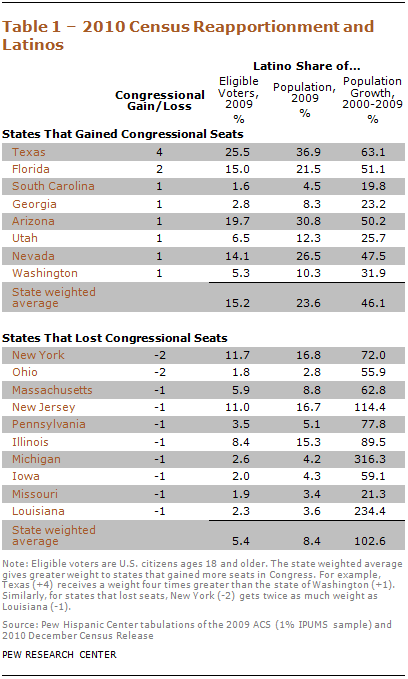 Ten states will lose seats — Illinois, Iowa, Louisiana, Massachusetts, Michigan, Missouri, New Jersey, New York, Ohio and Pennsylvania. New York and Ohio will lose two and all others one. Overall Latinos represent a greater share of eligible voter and resident populations in states that will gain seats than they do in states that will lose seats. Among eligible voters, in states that will gain seats, 15.2% are Latino, while in states that will lose seats just 5.4% are Latino. Among resident populations, 23.6% is Latino in states that will gain seats compared with 8.4% in states that will lose seats. In Texas, Latinos account for one-in-four (25.5%) of the state’s eligible voters and 36.9% of the state’s population. In Florida, Latinos account for one-in-seven (15%) of the state’s eligible voters and 21.5% of the state’s population. And in Arizona and Nevada, Hispanics represent 19.7% and 14.1% of eligible voters, respectively. Many of the states that gained congressional seats did so partly because of rapid population growth among Hispanics. Texas’ population increased by nearly four million, or by 21%, between 2000 and 2010. Nearly two-thirds (63%) of that growth came from growth in the state’s Hispanic population, which increased by almost 2.5 million.4 In Florida, Hispanic population growth accounted for more than half (51%) of the state’s population growth through this decade. Even in states with smaller Hispanic populations, Hispanics accounted for a large share of population growth. In Georgia, Hispanics accounted for 23.2% of the state’s growth. In South Carolina, Hispanics accounted for 19.8% of the state’s growth. Even in states that lost congressional seats, Latinos contributed significantly to population gains, possibly limiting reapportionment losses. For instance, in New York, 72% of the population growth this decade came from the Latino population. In New Jersey, the state’s population would likely have declined without Hispanic population growth. And in Michigan, Latino population growth kept the state’s population from declining even more than it did. Latino voting strength is limited by the fact that one-third of all Latinos are under the age of 18 and by the fact that many Latino adults are not U.S. citizens. Because of these factors, the share of the Hispanic population that is eligible to vote is lower than it is among either whites or blacks, even though the Hispanic population has grown rapidly in recent decades. In Texas, for example, even though Hispanic population growth helped to fuel the expansion of the state’s congressional delegation, fewer than half (43.1%) of all Hispanics are eligible to vote, compared with nearly eight-in-ten (77.3%) whites and seven-in-ten blacks (70%). In Florida, fewer than half (48.3%) of the state’s Hispanics are eligible to vote, while eight-in-ten (79.8%) whites and 63.5% of blacks are eligible to vote. In Georgia — a state where the vast majority of Hispanic adults are foreign born who arrived within the last decade or two — the gap is even wider. There, only 22.9% of the state’s Latinos are eligible to vote, compared with 76.2% of whites and 69.6% of blacks. Similar patterns are present in other “new settlement” states. View the full report (PDF) for detailed tables with state-by-state data on population growth and congressiional reapportionment at pewhispanic.org. 1. Final 2010 Census population counts for the Hispanic population, and all other groups of Americans, will be released by the Census Bureau later this year. 2. Among Hispanics who are U.S. citizens and 17 years of age or younger, some 15.3 million were born in the U.S.
3. Sum may not total due to rounding. 4. The Census Bureau has not issued state population counts by race and ethnicity from the 2010 Census. However, the 2009 American Community Survey (ACS) provides the most recent state population estimates by race and ethnicity. Latino population estimates from the 2009 ACS are used throughout this report.